The Meanings of Negative Emotions: A to Z is about self-healing on an emotional level that leads to physical empowerment. It’s about overcoming old programming and habits of negative actions, thoughts and reactions, to become aware, awake and alive, while taking back control over our lives. We need to see where unconscious patterns of reacting to life and accepting our personality traits, ingrained responses, and protections are exposed for what they really are, and to understand that having limited protections don’t serve us. As we choose to consciously change these patterns, we set ourselves free, opening our world to limitless possibilities. Sometimes we need a point of reference as we see ourselves repeating the same negative actions. This is why this book on Negative Emotions was written. When we see ourselves doing things we shouldn’t, we can look up the emotion involved in the book to see what our actions really means. As an evolving soul, we can change unconscious behaviour to something more positive. And the more aware we are, the more in control we are of the outcome of our lives. When we change negative-unconscious-ego traits to positive-empowering-happy traits, we are finally fully awake and see things as they really are. 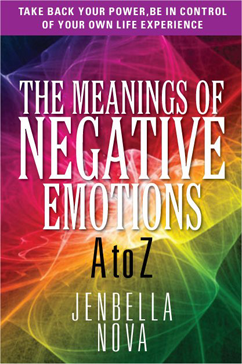 This book is like a dictionary: A to Z on all negative emotions, reactions and feelings. So when you see yourself acting or feeling in a way that does not serve you can look up the emotion and see how you can change that aspect of yourself. Aggression: Aggression, acting tough, and having a short fuse is transparent in its obvious need to have a place to hide from feelings. There is nothing tough about aggression it ruins friendships, marriages and spoils the other person’s day. Aggression is not entertaining. Aggression does not have true strength, it’s hollow and obvious. There is real strength in patience, non-reaction and inner peace. Clingy: Feeling like you are not enough and need a person as a life line to feel alive or needed. If you stay clingy you will either repel the person due to this suffocating action, or you will give away your power and live in another’s shadow. This is just an excuse to not take responsibility for your journey. Miserable: A state of mind that you chose to reside in to feel sorry for yourself. Feel what the issue is and let it go without judgement. This can often be a way to manipulate others as if they are responsible for making you happy. Paranoid: Choosing to believe and own your negative thoughts as your truth so you won’t have to be responsible for the life path that you have chosen. Your beliefs can either serve you or devastate your life. You choose them as your reality they don’t control you, change your own thoughts and rise to a higher vibration. Generally the negative emotion or action is an old habit and is unconscious. Changing it will empower your life and improve your power of attraction. For what we think, we are what energy we put out, we attract back. We can wake up and empower our own lives and the way we feel.